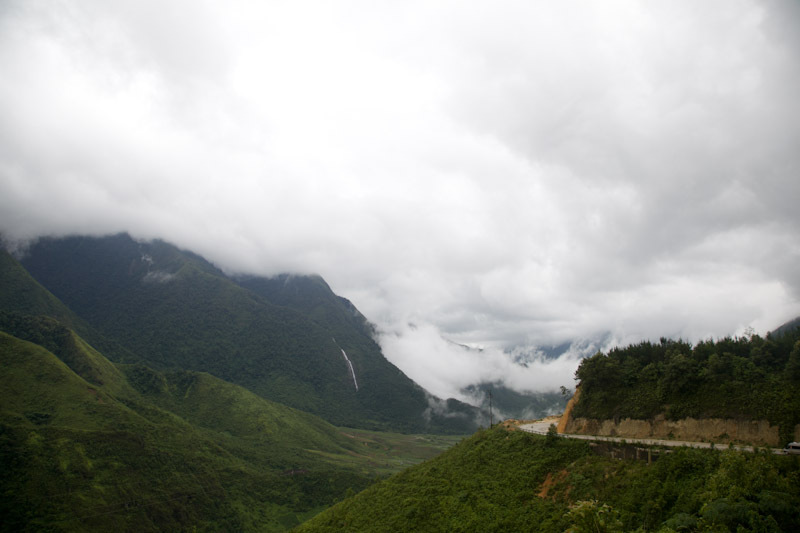 We landed in Sapa with some ideas of what to do and some recommendations we had picked up along the way. One of them was doing a cycle from the O Quy Ho Pass cycling downhill into the next valley region Lai Chau. The three of us were all keen to go for a cycle so we signed up with a shop near our guesthouse with a guide whom looked liked, Mr. Chow from the hangover! Please note this is not bad photography by Emma this is how bad it was. Our Guide, to whom I will refer to as Mr. Chow, did not seem too phased he said once we get going and get further down the mountain the weather and vision will improve, there was some skepticism amongst us but we were not going to turn round and go home it was Lai Chau or bust! It was time to set off as we did off went Mr. Chow followed by Steph and Emma and then I followed, suddenly out of nowhere No.2 joined us and skidded off the bike to onto his feet (lucky for him) but danger close to Emma and I, we both looked at each other with a shocked and concerned look, then we speed off with a ‘get him the hell away from me pace’. The Tour was on. Now we all started cautiously on the breaks, as you have seen the weather was not its best and the conditions pretty treacherous for downhill biking, especially as every so often we would be dodging small landslides. But after a 15minute descent, we got below the cloud and the scenery started to expose itself; and we all let go of the breaks. We all did and so did guide two haring past us with poncho flapping around like a bag in the wind and with some interesting steering and control techniques. We all were now aware of his technique and were all keeping away from him. Our cycle was fantastic and the enjoyment grew and grew as we went, and so did the entertainment value of guide two who seemed to be enjoying himself/trying to kill himself. After a while we started to hit gravel roads in between the tarmac with more heavy duty off road mountain biking terrain and often I past guide two or he past me and several times I saw him almost fly off the bike or hit bumps so hard he could not control the bike, it was like watching a comedy sketch. We stopped a couple of times and at one point Mr. Chow was with us we asked him about his colleague, looking very unimpressed with the guy but also with a wry smile he told us he had not cycled before and he was a friend of a friend he was trying to get a job for, but even Mr. Chow had accepting this was a failure as was enjoying watching the antics and struggles of guide two more than us, he was just to be a little discrete and professional. I personally was completely entertained and slightly impressed with his attempt straight at the deep end, but slightly concerned about his risk to us on the road, I was expecting to see this plastic bag eventually miss the breaks and fly off the cliff edge! We continued to roll down this fantastic landscape all three of us enjoying it more and more, and it got more and more challenging with the road surface, often crossing massive cracks in the road or cycling through sections that had become small rivers it was a thrilling ride. After about 2 hours of cycling No.2 finally gave up, I think he must have come off his bike and was just done with his career as a Cycle tour guide; he retired to the van for the remainder of the trip. With the roads safer for the day we carried on winding down from the mountain we started to hit farms, small holdings and villages. We stopped a few times and visited one village where we sat down with the women and children seeing how they lived and what they made which was great, we were also armed with some rice cake snacks (which were delicious) so as we passed children or they came up to us at our stop points we gave them a snack or two. Once we had reached our destination in Lai Chau we were presented with a feast for lunch in which we demolished in short order. Once we were done eating we met the support vehicle and headed back up the mountain range back towards Sapa. Every so often we stopped to look back and jump out and take some photographs of the landscape, at one point as we got higher the cloud cleared to reveal the road we had cycled down that morning, winding its way like a muddy stream! We looked on all of us proud and stoked at what we had done that day and chuffed we had survived unscathed! Although that was not the last of the cycling, we reached the peak again and stopped off for a look at a waterfall, the guide offered a chance to cycle back down the other side of the Mountain into Sapa, my fellow cyclists politely declined due to the weather conditions, I jumped at the chance. Five minutes later Mr. Chow and I were flying down the mountain towards Sapa averaging about 25 to 30 miles an hour, it was an exhilarating ride.